In the vuo comp attached i want to use the "process list" node to be able to make a grid of thumbnails of videos in a folder. The green nodes (which are connected) are working all right but it only draws 10 thumbnails since this is the number of "Get item from list" that I use. What I want is that the grid is partially dynamic according to the number of videos in the folder (within the limit of the size of the grid: columns/rows). If you change, from the green node to the cyan node, the "Processed List" output that gets to the "Arrange Layers in grid" it does´t render any thumbs. I tried this in a different ways (sometimes it did not let me connect one node into another so i tried different sequence of connections ) Once it worked for the first time I dragged a folder, but from there it did not work any more. 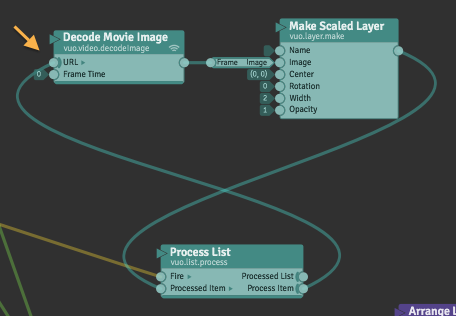 I can see the cyan "Decode Movie Image" carries data, but the cyan "Make Scaled Layer" does not. Mmm. I would have used "Process List" the same way. Strange it doesn't work. I'm curious to hear if there is an error in the method, if there is a better way to get this done of if this even could be a bug. Think the Vuo team will answer this. Last night when I was testing the "process List" node I thought it was a matter of the kind of data that flowed. When the node was set to process "layer" data I could not connect the "url" cable. I tried using separate "process list" nodes, one for url data and another for layer data, this didn't work either since the url processed list would not connect to the "fire" port in the Layer "process List node" this is when I started to try different sequences of connections form library nodes getting mixed results. Maybe it is the method. You can fix it by adding a cable from the Process Item output port of Process List to the refresh input port or Frame Time input port of Decode Movie Image.